Genie Lift Details - Quasius Equipment, Inc. 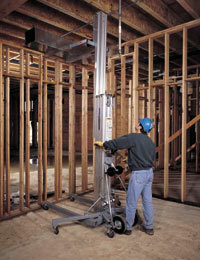 The Genie Lift Super Boom is a crank up equipment lift. It is a manual push-around unit that can lift equipment up to 650 lbs to a 25' height. It's lightweight aluminum construction makes for ease in handling. This unit is designed to be used on hard surfaced floors and the castors will not function on grass unless boards are laid down. The unit can be loaded onto a pickup truck or trailer but must be secured with rope or tie down straps.